The following words are arranged in order of importance. Firstly, take a moment to donate to the flooding in the Philippines. I get asked every day if I Wrote This For You is going to be available over there and the least I can do, considering the kindness that’s been shown to me, is draw some attention to the recent flooding. Today, after writing the first sentence in a spiral-bound notebook by the side of my bed in 2006 (and the first sentence on the blog on the 5th of July, 2007), I Wrote This For You is officially being released as a book, although you’ve been able to pre-order it for a few days now and some people have even managed to get some advanced copies. Here are several questions that I haven’t answered over the years that have been emailed to me, asked in the comments section or simply questions that I believe should be asked. Who I am isn’t as important as the story I want to tell. I write the blog semi-anonymously and anyone with 5 minutes to spare on google could easily find out everything they’d ever want to know about the project or me. The rule is, I don’t have a name here. The name gets in the way of the story. Trent Reznor gets to be Nine Inch Nails when he’s on stage or recording an album. Stefani Joanne Angelina Germanotta gets to be Lady Gaga. I get to be pleasefindthis or ‘Me’ here. How do people react to the blog or you when they find out you write it? It’s mostly positive. I try not to be too much of a let down in real life. It’s very strange for me as I’m quite a closed person. I enjoy my privacy, which is a strange thing to say I guess considering I’ve spent the last few years publishing the most intimate details of my thought process online. There are people who have a kind of cynical “Ewww, gross! Emotions! Where’s your sense of detached irony? !” view on things but I feel sorry for those people more than anything. There’s a generation that have reached or are reaching adulthood right now that have been raised in an entirely different way to any other generation before it - and they look upon those of us who insist on viewing the world with that detached sense of irony or cynicism like we’re crazy. There’s a generation of people who aren’t ashamed of how they feel or expressing how they feel, is what I mean. I think that’s beautiful. Why has it taken so long to turn the blog into a book? Because it’s complicated. It’s not a story about vampires or wizards or a spy thriller. It’s hardly even a story at times as much as it is an experience. Myself and Jon, the photographer, do what we enjoy first. We were pleasantly surprised when we discovered that people liked it and then mortified at the skepticism and confusion of the traditional publishing industry when we showed it to them. We had more followers/readers than all the authors in some publishing houses combined, and we still got form rejection letters from them. One of the few that did express interest asked if we could give it a slightly more ‘religious spin’. I’m not comfortable with pretending I’m writing on behalf of some deity. In fact, I published my real name next to the work for a while because people started treating me like a guru or Buddha figure. I am not that. I am human. Michelle at ireadiwrite, our publisher, is wonderful, the press is small and allows us a lot of creative control. We’re important to them, they’re important to us, and that’s a wonderful dynamic to have in a relationship. However, next time I’d like to do something simple. Do you have any idea how hard it is just to describe what I Wrote This For You is to someone who’s never heard of it? Why should anyone bother buying the book when everything’s available on the blog for free? The book is divided up into four sections; Sun, Moon, Stars, Rain – which is a tribute to Anyone Lived In A Pretty How Town by E.E. Cummings as it’s my favourite work of literature that revolves around pro-nouns. Those four different sections collect the posts into four distinct phases that describe, hopefully, the human condition. Sun is about looking for love or the potential for love. Moon is about the act of being in love. Stars is the loss of that love. Rain is about rediscovering hope in life, at the end of that cycle. The blog, on the other hand, jumps around. I can’t, for obvious reasons, write very often about the way I currently am or feel or it’d be like treating everyone in my life like they were on a reality TV program. So I write about events and relationships at random quite often, and jump around, referencing old love letters, things I said or that were said to me and so on. The book makes sense of this randomness and hopefully, puts it in some kind of order. There’s also several entries that only appear in the book, including an ending. I wrote the final entry, several minutes after I wrote the first one in 2006. You can’t write your first sentence, really, until you’ve written your last. Does that mean I Wrote This For You is over? No. But I will be taking a short break over Christmas and New Years just to recharge my batteries. I’d like to do more, such as a spoken word album or live readings where my readers are, doing that however all depends on the success of the book. In saying that, I think people forget that I have to do this over and above a very demanding day job, which right now, pays all the bills. We, like postsecret, don’t advertise on the blog, don’t do giveaways or run competitions on behalf of other people or sell text links or do product reviews, which seems to be the preferred way to make money from a blog these days. That’s because I, and I think I can speak for Jon here too, don’t want to succeed on anyone else’s terms but our own. Put it this way, I’d rather be dirt poor on my own terms than rich on someone else’s. Is the book available at a store near me? Probably not unless you ask them to order it for you, which I encourage you to do. I live on the tip of Africa, the photographer lives in Germany, our publisher is in Canada, our main readership resides either in the continental United States or Malaysia. Organising a global, store-front release that’d make everyone happy would be impossible so we’re focusing our energies online. So if you can order from Amazon, Barnes & Noble or iTunes, we’ve got you covered. If you can’t, I feel your pain. iBooks isn’t even available in my country and Amazon delivers here with only varying degrees of success. We’re doing our best and working with our publisher to make sure it’s as widely available as possible. Hang in there. 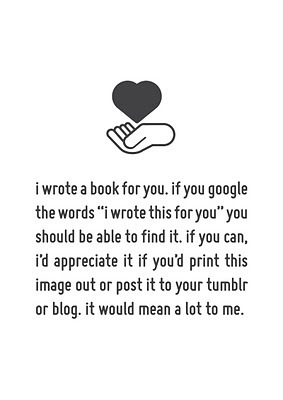 If you could spread the word about the book, paste the image below on your blog or tumblr, it would be sincerely appreciated. Our budget for all of this is exactly $0 and whatever money we do spend comes straight out of our own pockets at this point. You can catch an interview with me in Cosmopolitan (South Africa) in January and with Jon in Heso Magazine (Japan) in the next month or so. Any other journalists are welcome to contact us on pleasefindthis at gmail dot com. I’ll be answering any questions anyone has in the comments section below for at least the next 24 hours. Finally, thank you for reading. You have no idea how well-timed, anonymous or otherwise comments here have turned everything around completely at times. I occasionally find myself in dark places (shocking, I know) and you, yes you, just by choosing to spend time with my words have been the light that’s drawn me out of those places. I love you and can never fully repay you for that. Iain, thank you for posting a donation link to my country. You're a good soul. Merry Christmas to you, and to Jon, too! This blog has held a large part of my heart for 3 years. It has been, and will continue to be, my favorite piece of literature I have ever stumbled upon...thank you from the bottom of my heart. Congrats for your book. I'm looking forward reading it. I hope it becomes available in print here in the Philippines or at least via Book Depository. thank you for posting a donation for my countrymen. kudos to your book launch and happy new year! I have been reading your blog for a few years now and this has been the first time I will have commented. I am 16 year old girl from England and this blog has helped when I am in the darkest of places. I check it every single day without fail, in hope for another sentence that will keep me going until your next post. And for that I thank you, and I will be purchasing your book as soon as possible. Thank you. Have a beautiful christmas. Were can we purchase in south africa? You, are in one word, 'beautiful'. You, make me smile and cry all at the same time. Its the most wonderful feeling one can have. I just want to say thank you for always being there, in my many moments of sadness and frustrations, I find comfort and solace in your writing. I can feel the soul behind your every word, behind this blog. Thank you for being you, for being a beautiful soul. You can get it in South Africa in the same way you can anywhere else fortunately/unfortunately. Are you friends with any other South African writers, like JM Coetzee or something? I'm so happy to know it's finally coming together. 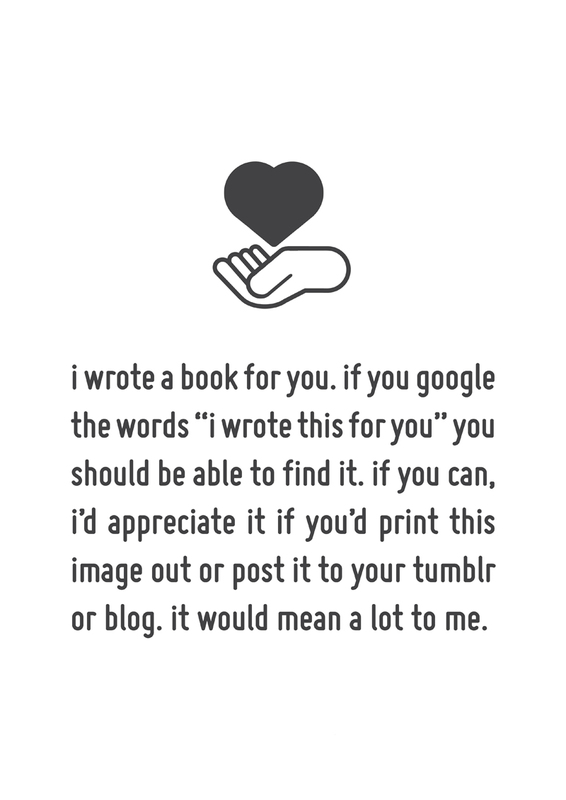 I wrote this for you is a wonderful project and it gives us hope and things to think about and happiness. I hope you keep writing for us. Cos we'll keep reading you. This blog is a brilliant work of humility and art. Some words have struck a chord in me, some haven't yet but I know, each word you've chosen matters. I haven't a clue what to say besides, thank you, for being willing to share something so genuine and filled with emotion. Thank you, for being a constant, comforting person to visit. Thank you. I don't really hang out in South African literary, academic or, for that matter, poetic circles. So no I don't know JM Coetzee. The traditional writing establishment in South Africa is quite insular, doesn't seem to take kindly to anything that hasn't first been done overseas and seems to be very much about back scratching. I've never felt welcome in it (as far as I can tell, I'm looked at as some kind of oddity) and I'm more comfortable doing my own thing anyway. I couldn't tell you what you mean to me. Thank you for your open & courageous heart & your words, which have saved my sanity more than once. I treasure my IWTFY book so much that it is on its way to my someone. When I couldn't see the light your words were the ones what made me feel alive, loved and missed. The photographs were also small - important - details that I love dearly. I wish you and Jon all the best for your book. Merry Christmas and Happy New Year! I read this last post and I just wanted to thank you for creating this blog and now the book as well. I discovered this a little over a year ago and ever since I have found your words to be poetic and artistic but more importantly there have been times when they have been an inspiration or have helped me to look at a situation differently. So thank you. Congratulations. I admire your writing greatly and often write your words down, but miss the accompanying photographs - like a movie story you hear from someone else. Do you deliver in India and if not, how can I buy your book. Do let me know in reply. Thanks again. For writing. i have your book and it warms my heart. again, thank you. To be able to touch a part of you, to hold you in my arms and know that you care and love and feel as much as I do, will be a great comfort. I eagerly await the arrival of my copy. And though I know, like most of us here I guess, what your name is, and saw what you looked like in a video, heard what your voice sounded like, you're right that such things don't actually matter. A name, a face... if you're anonymous here, it's for a reason. What you write here comes directly from your soul and all I know is, that soul is a wonderful one. So thank you again for all the wise words, the reassuring words, the helping words, the thought-provoking words you've written here over the years. I wish you all the best in everything you do, and that life may be as kind to you as possible. love to you, on this day, from me. Anything I can do to help you, and help spread your work is something I will do. No one knows just how much yours words have changed and shaped me, and no one knows how happy I am that your words will reach others through your new book. I pinned a link to your blog/book to my "wish-list" on Pinterest dot com, for everyone to see. Hope it helps spread the word. i memorized anyone lived in a pretty how town in 6th grade, and recited it to the class. since then, its been my favorite poem of e.e.cummings. now i want that book more than ever. Iain, I love you. I always have. Thank you for giving me an ounce of hope every week, for your words that make me pick myself off the floor time and time again. I wish you nothing but the best with your endeavor. Amazon doesn't ship to my country either, but look forward to one day holding your book in my hands...even if that day is years from now. Thank you. I believe your words are words of the human soul. That each person carry's them inside but rarely ever get to discover. You however know them. these words come pouring out of you effortlessly. You have been given this wonderful gift to speak these words and I am so grateful that you didn't keep them to yourself, that you shared them with us. These words are words that people need to hear. they help us all so much in their own special way and I could never thank you enough. I haven't been reading this blog as long as others, though I know I've been visiting this place for over a year. And through reading the comments on this post, I now know your name is Lain (which is a beautiful name, in my opinion). You continue to inspire me to be a better person. Thank you for everything. Though this is early, Merry Christmas! :) And a Happy New Year, too. You are amazing. Your words have helped my best friend and I through some very dark times. The world is a tough place for fragile-hearted little girls. how did you become so full of love? that is what i want in my life. i'm off to a good start, but there are times i small my heart, draw inward, fade to dark. perhaps i'm in the minority, but it's the how of life that i haven't figured out so well yet. i continue to try. i feel tremendous gratitude whenever i someone else shows me a missing "how". (eg: how to forgive. how to love when its uncomfortable. how to keep going on days when my brain chemistry or some such thing has thrown my spirit under the bus). i just discovered you just last week. i have ordered the paper copy of your book and can't wait for it to arrive. i may just buy two hundred frames and hang the pages all over my walls. surround myself with beauty.